The new storage technology aims to be 1,000 times faster than flash, and will compete with similar tech from Intel and Micron.HP and SanDisk are plotting new storage technology that could be 1,000 times faster than flash memory, though they’ll face some competition along the way. Details on the new technology are scarce, but the goal is to create a “universal memory” that serves as both long-term storage and RAM, the Wall Street Journal reports. The goal is to commercialize this technology some time between 2018 and 2020. Why this matters: Today’s computers offer RAM and storage separately, because the former is much more expensive and purges its data when the machine powers down. Programs and files are stored on flash memory, but during use they’ll load some data into RAM for faster short-term access. A single type of memory for both short- and long-term storage could boost a PC’s performance dramatically. HP and SanDisk aren’t the only ones with eyes on next-generation memory. Earlier this year, Intel and Micron announced a partnership on a new type of storage, touting the same “1,000 times” performance improvements. Originally dubbed 3D XPoint, the technology will commercially be known as Intel Optane, and is scheduled to hit the market in 2016—well ahead of HP and SanDisk. The two companies aren’t just looking at servers, which are often the first stop for new storage technology. Intel aims to have Optane in laptops next year as well, and is introducing storage controllers, interfaces, and interconnects to help make it happen. 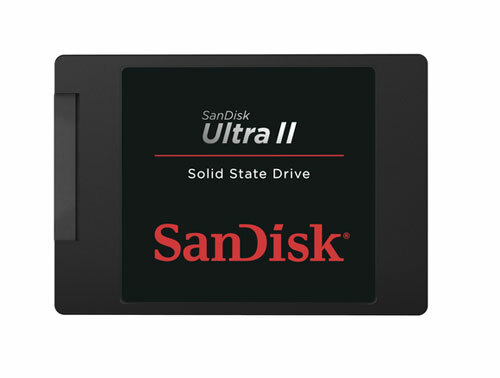 HP and SanDisk are also collaborating on computer systems that use their storage technology. The Wall Street Journal’s report sheds some light on why the companies may be entering such fierce competition in the first place: Neither Intel/Micron nor HP/SanDisk plan to license their technology, which means you won’t see it on products from Seagate, Samsung or other storage vendors. The licensing model typically ends with vendors racing to the bottom on pricing, but apparently that won’t be the case with this technology. In other words, expect to pay a premium for those faster speeds, unless (or until) another entity comes up with something similar that all vendors can use. The SanDisk Industrial XT iNAND embedded flash drive was introduced on Oct. 5, 2015.The SanDisk Industrial components are designed to work harder, last longer and withstand harsh conditions. Consumers rely on flash memory cards in phones, tablets and cameras every day. But put those same cards in security cams, cellular base stations or the electrical grid and you’ll have a problem. Industrial devices need flash that can work harder and withstand more extreme temperatures than consumer gear, and they’ll be operating out in the field years after a typical phone or camera card has been replaced. So SanDisk is introducing a line of components built for the Internet of Things. IoT is expected to put thousands of sensors, meters, robots and machines into the field with growing needs to process and store data. 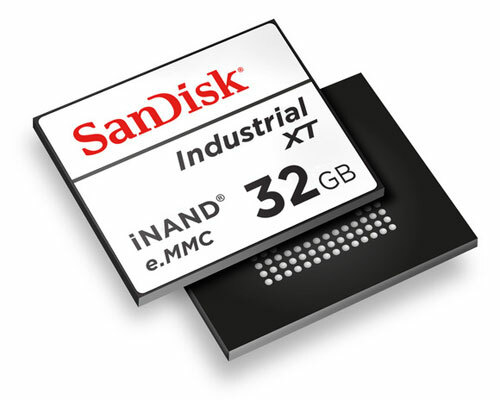 The SanDisk Industrial line includes cards for the familiar SD, microSD and eMMC (embedded MultiMediaCard) standards, but built to tougher specifications. For example, the SanDisk Industrial XT SD Cards and XT iNAND embedded flash drives announced Monday are rated to work in temperatures as low as -40 degrees Celsius (-40 Fahrenheit), compared with -25 Celsius for a typical consumer SD card. The industrial cards can also write more data before they have to be replaced: as much as 128TB, far more than is typical for a consumer-grade part, said Martin Booth, director of SanDisk Industrial and SanDisk Automotive. This kind of endurance is what’s needed in IoT devices like remote video cameras that will capture video around the clock for as long as five years, he said. Otherwise they would have to be replaced more frequently, a costly proposition if the owner needs to send out a truck and a technician. SanDisk achieved the gains by holding back on things that make flash for a phone or camera attractive to consumers, like maximum write speeds and densely packed memory cells that drive down cost per bit by half every year or two, Booth said. The heavy-duty flash is made with an older 19-nanometer manufacturing process, not the 15nm process that’s the cutting edge today at SanDisk. Another feature, Enhanced Power Immunity, will help prevent data loss in case of power failure. It uses special firmware for recovering data if the power is cut off, something ordinary flash cards may not be able to do if, for example, the user pulls a card out of a PC while it’s still transferring data. The new parts range in size from 4GB or 8GB up to 64GB and will cost more than comparable consumer-grade products, but less than twice as much, Booth said. They are available now and will only be sold to equipment manufacturers.